Depending on how fast you heal the process can take anywhere from three to nine months from the first procedure to the last. Most of the time is spent healing and the new bone growth in your jaw. If you are someone who heals slowly this can be a problem for you. It is always best to discuss your options and the best one for you with your dentist. When it comes time to actually place the dental implant the oral surgeon will cut open your gum and expose the bone. There will be holes drilled into the bone and a metal post will be placed that will serve as the root for the tooth and it is put in deep. This can cause pain but it is manageable. With this process you can get a partial denture for looks if you prefer one that can be removed for cleaning. Once this has healed an abutment will be placed and the procedure is not unlike the first with the exposing of what needs to be exposed. 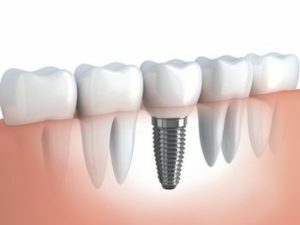 After the abutment heals you will then have your choice of teeth installed into the implant. The procedure while not for everyone is relatively safe as long as you do not have any reactions to the medications used to put you under or have any complications and most would say it is well worth it. Dental implants won’t set off the airport metal detectors.